You have a library card. Don’t be afraid to use it! Most public libraries in the U.S. offer electronic books to their members and can be downloaded remotely. 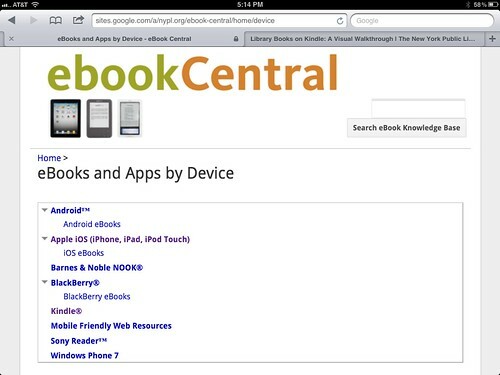 The New York Public library has created e-book central to help their members navigate borrowing and downloading books and other materials. Luckily for all of us, the process is pretty much the same at all U.S. libraries. All you need is a library card (I know you have one). If you are in the U.S. and can’t find your library’s online catalog and/or their ebook collection. Let me know in the comments. I’m serious – I’m a Librarian, have mad skills and want to help you. well this answers my question from your flickr photo. peninsula library probably does have this as well i just have never investigated. i am kind of laughing over the “mad skills” part…yes that is very true. you do have “mad skills”!